Soft bodies? Rigid bodies? Constraints? I am working on a 6 second animation. 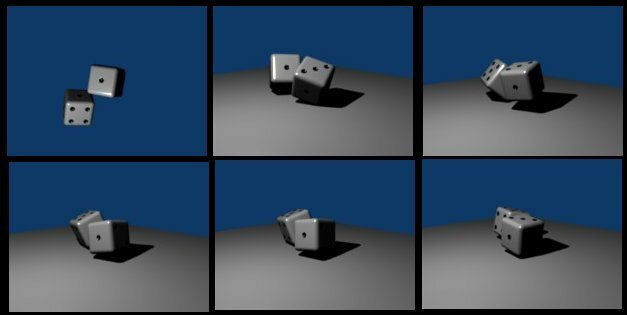 The animation consists of two modelled dice and a camera at floor level. This is a “high hat” shot. I am only at the beginning stages of this, and I’m trying to get an overall idea as to workflow. What I am attempting to do in the camera shot is to animate the falling of two dice, the camera tracks the dice. The dice fall to the floor and hit the floor and bounce with natural physics for the objects. I have been working with Blender for about a year so I am well versed with the basics of the interface. What I am looking for are some suggestions as how to accomplish this task. I am guessing it has something to do with soft bodies or rigid bodies and constraints. Thanks for any help anybody can suggest. Well, you can use the game engine to simulate the dice falling and bouncing then rolling after they strike the surface of the table. as long as you bake the result to IPOs, it’s there ready for a high quality render. If it plays too slowly, you can hit f10 and change the MapNew figure & the fps. If you want to make the animation happen in 1/2 the time, make the MapNew figure 1/2 of the MapOld figure & change the frs/sec to 1/2 of what it already is. I modelled a dice and created a plane for it to fall onto. My problem now is that the camera I created to track the dice does not work properly. I start the GE simulation from side view to see if all works ok, and everything is ok. When I did it, I selected the camera then shift selected the die I wanted to track then hit Ctrl-T then chose TrackToConstraint. If I tried to parent either one to the the other first(camera->dice or dice->camera), things got a bit screwy. When I tried to work out how to go about it yesterday, I just created two cube primitives without duplicating one from the other. After reading your post just now, I had another idea - how about modeling a cube and saving that in it’s own .blend file. Then, just Append/Link in that cube twice - that way I could use the die from one of the beginners tutorials without having to model the blessed thing twice. Guess what? Works like a charm!!! - here’s a couple of frames.